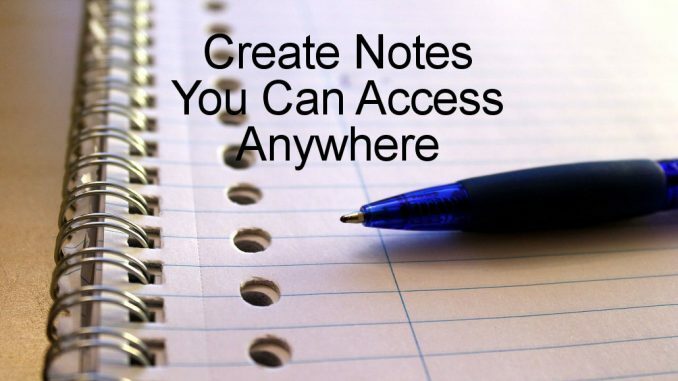 There are many note-taking apps and there are some great ones like Google Keep and Microsoft OneNote, so this is a tough area to get into. 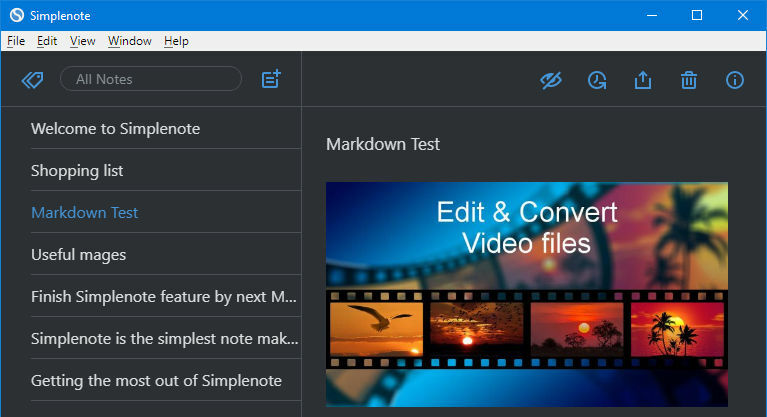 Simplenote has some unusual features that make it stand out from the crowd these could make it more useful than a traditional note-taking app. I will be using the Windows 10 app from the Windows Store here, but it can be used on any device and even on the web at simplenote.com. The features are similar across all platforms. 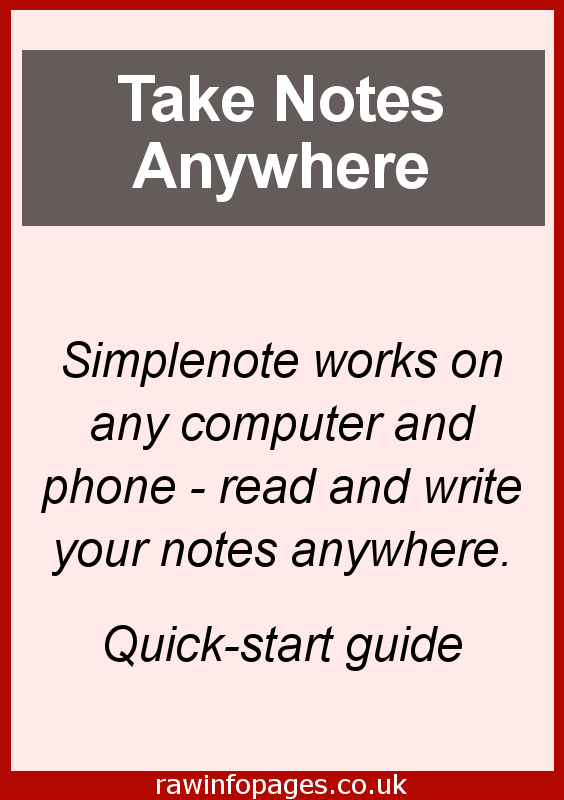 Simplenote requires an online account in order to work and this is so that it can keep your notes in sync across all your devices and operating systems. What is unusual is that you can log in with a wordpress.com or Jetpack WordPress plugin account. This is because the app is from the same developer – Automattic. 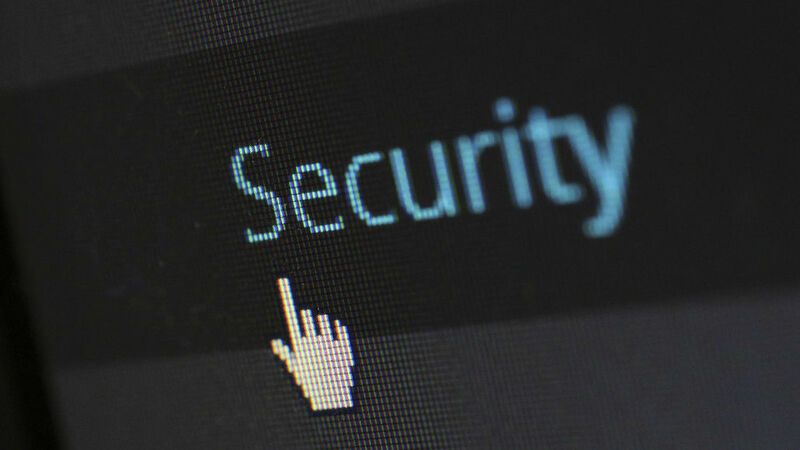 You don’t have to use WordPress/Jetpack and you can create an account with an email and password or login with Google. It is interesting though and useful if you already use Automattic products. I logged in with the Windows 10 app and instantly all my notes created in the Apple Mac app were there. Simplenote looks very simple and at first sight you might wonder if it is too basic to be useful. However, it has more features than you might think. New notes are created by clicking the icon at the top and the first line is the heading. This is in a slightly larger font and it becomes the title of the note in the list on the left. As you type in text, the usual keyboard shortcuts for cut (Ctrl+X), copy (Ctrl+C) and paste Ctrl+V work as expected, but there is more, a lot more. Click the i in the top right corner and there is an option to turn on markdown. This is a markup system that enables you to specify text formatting using special characters. For example, start a line with a hash and it becomes a Heading 1 style, two hashes is Heading 2 and so on. Use an asterisk for bullet points – you only need type the first one and the next one appears when Enter is pressed. There is bold and italic text too. To see how this looks you must click the eye icon in the toolbar at the top. Markdown does not have universal support, but it is quite common and is built into many applications. WordPress supports it for example, and it would be possible to write blog posts in Simplenote using markdown to specify the formatting and headings, then when it is copied and pasted into your site, it is correctly formatted. See How to simplify writing WordPress posts by using Markdown. As a further aid to writing, clicking the i in the toolbar opens a panel on the right showing the number of words and characters in a note. When notes are deleted, they are not lost and they are just moved to the Trash. Click the icon in the top left corner to open the sidebar and you can click Trash and see deleted notes. They can be really deleted or restored. Simplenote goes even further and there is a fascinating feature that enables you to view notes over time. Click the clock icon in the toolbar and a note history slider appears. Notes are saved as you work on them and you can view the state of a note at any time, whether it was created today or last month. Drag the slider to view the revisions and changes to the note and at any point it can be restored. This is a brilliant feature. Three sorting options are on the View menu and notes can also be pinned. It is hard to see, but if you click just to the left of a note title in the notes list, it isn then pinned to the top. Tags can be added to notes in the bottom left corner of the note editor. Open the sidebar to see a list of the tags and click one to view all the notes associated with it. 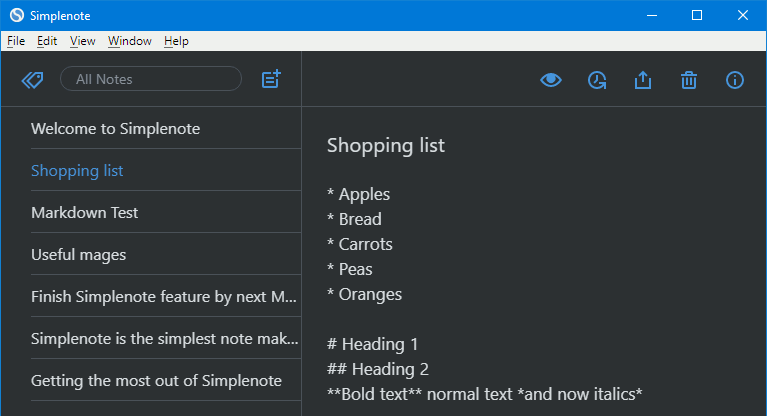 The search box at the top is another way to find notes and the notes list is updated as you type with the selected text highlighted in notes. There are three views of the notes list – Comfy, Condensed and Expanded. Condensed shows just note titles and the expanded version shows the first lines of the note. When it was launched, Simplenote was too simple for my liking, but it has grown into a useful tool with some interesting features. It is available everywhere and on everything, so you can read and write notes wherever you are. 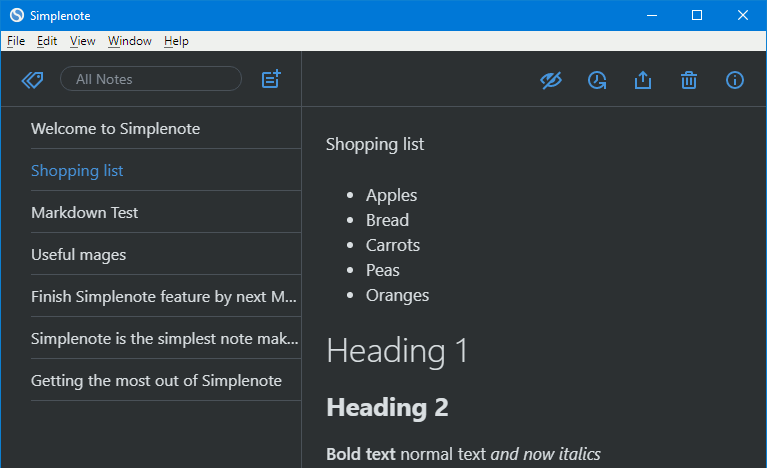 It also supports markdown formatting, tags, searching and pinned notes. You can even collaborate on notes with other users and you just click the sharing button in the toolbar and add their email address. You can also generate a public link that lets anyone with the link view it on the web. Combine this with the markdown formatting and you have a very simple way of publishing articles online. 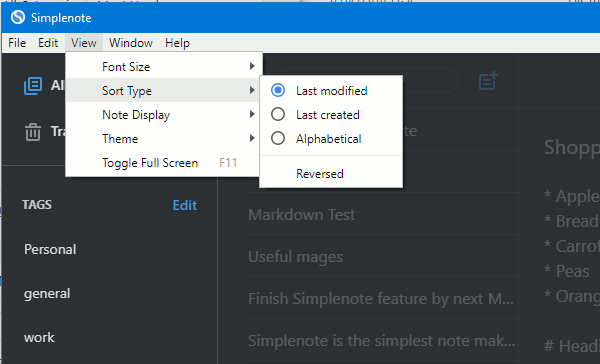 Simplenote is a good note-taking app that has some unusual features that might tempt you away from Keep and OneNote.